Project 57/366: Shoot Me Mom! Buy Two, Take One For Free! O, C'mon... Give Me A Break! I really felt sad for those who were became casualties of the Earthquake yesterday at Visayas, particularly in Negros and Cebu. More than Eighty eight people are claimed to be dead while others are still missing. The Kagay-anons felt it too but of minimal intensity only. 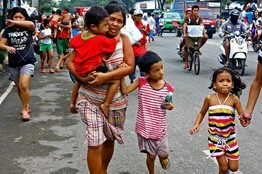 The memories of Tropical Storm Sendong are still vivid on the mind of Kagay-anons. Then here comes another threat, the earthquake. People are getting anxious and conscious of the possible natural calamities that may occur and they tend to get paranoid too. Yesterday, I was alone in the office checking the work of my students in the computer when I noticed that the computer table and my flat screen monitor moves. I was so scared that I immediately turned off the computer then I called up my husband asking him if he felt it too. Seeing the news on television scared me all the more. Condolence to the bereaved family.